...when your having fun! Boy, isn't that the truth? I can hardly believe it's been two months since my precious girls joined the world. We've had our ups, downs and all arounds, but I am thrilled to say that we are all doing GREAT! 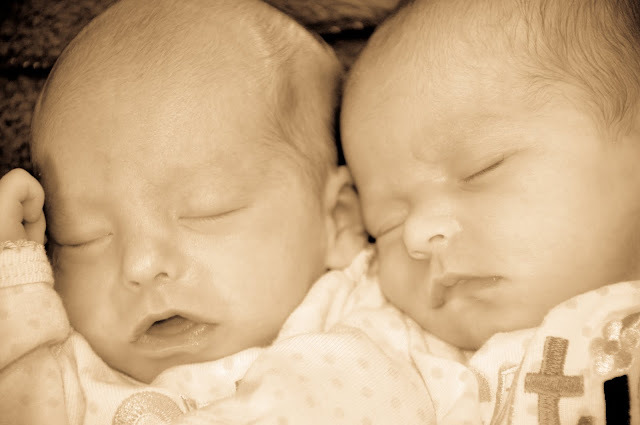 Layla and Jenna had their two-month checkup today and they looked perfect. That's the word the nurse used, I didn't just make that up, but I certainly agree! Layla weighed in at 7 lbs 8 oz which put her at just less than the 1st percentile...hey, at least she's on the charts now. Jenna weighed in at a whopping 8 lbs 15 oz which is in the 9th percentile. They got their first round of immunizations today and they took them like a champ. The girls were dedicated at church on Mother's Day. May Fair - no Indian tacos for the girls this year. They didn't quite enjoy this Easter photo op! We had their two week pictures taken by my friend, Megn. Hopefully, it won't be another two months before I post again!